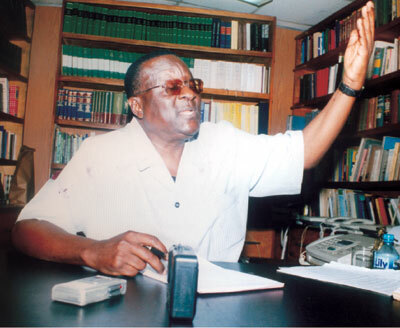 Gani Fawehinmi who has died aged 71, was one of the most famous figures in Nigerian history. Fondly called "the people's lawyer" and "Senior Advocate of the Masses", he used his legal training and resources in fighting for justice for the Nigerian people. Along with the likes of Nobel Laureate Wole Soyinka, Fawehinmi became the loud conscience of a hundred and fifty million people; a man for whom silence was never an option, and for whom there were no tyrants too big to be challenged. In fact, the bigger the better! For over three decades, he endured imprisonment, harassment and the climate of assassination created by the successive military regimes, in battling causes which, even though, they did not always succeed against totalitarian governments who controlled the organs of the law, succeeded in focusing national and international attention. He also took on the villainy and corruption of civilian governments, highlighting their illegitimate means of coming to power. Fawehinmi is not everything to everybody. You either like him passionately or you hate him intensely. This is because of his boundless and sometimes suicidal energy with which he tenaciously and uncompromisingly pursues and crusades his beliefs, principles and ideals for the untrammeled rule of law, undiluted democracy, all embracing and expansive social justice, protection of fundamental human rights and respect for the hopes and aspirations of the masses who are victims of misgovernance of the affairs of the Nation. One of his most notable fights was the mysterious killing of <?xml:namespace prefix = st1 ns = "urn:schemas-microsoft-com:office:smarttags" />Nigeria's leading editor Dele Giwa by a parcel bomb in 1986. Fawehinmi openly accused the ruling military junta of General Ibrahim Babangida of being complicit in the journalist's murder. Fawehinmi took the case through to the Nigerian apex court, the Supreme Court, but lost. For this, the regime tried to publicly humiliate him. In fact, the dictator Babangida, when asked why his regime detained the late lawyer, told a magazine that it would have been out of place not to, because all regimes before him had done the same! Fawehinmi fared no better under the military regime of General Sanni Abacha in the early 1990s. Fawehinmi led the fight against the cancellation of June 12, 1993, presidential election and the subsequent detention of the election’s victor Chief Moshood Abiola. His international passport was seized on many occasions. His residence and Chambers were ransacked several times. He was beaten up many times and was deported from one part of the country to another to prevent him from being listened to by the masses. Some of his books which the military junta did not like were confiscated and one of his Lagos houses where his law books were kept was about to be set ablaze when the would-be perpetrators were caught and apprehended by neighbours. Yet, he was undaunted and until his death he continued to take on the ruling class, filling a law suit against the current civilian administration just a few weeks ago. Ganiyu Oyesola Fawehinmi was born in April 1938, to a very prosperous family in the town of Ondo, western Nigeria. His father, Saheed Tugbobo Fawehinmi, a leading traditional and Islamic figure in western Nigeria, was a successful timber magnate, a philanthropist and an opponent of excessive taxation of the poor. His grandfather Chief Lisa Alujanu Fawehinmi took on the British on behalf of his people in the late nineteenth and early twentieth centuries. While in secondary school, his headteacher wrote a note to his father that the young Fawehinmi will make a brilliant lawyer and after secondary school education he traveled to Britain in 1961, to read law at Holborn College, University of London. Before he could completed his second undergraduate year, his father died and his source of finance quickly dried up. He then worked as a toilet cleaner in order to finance his degree. Fawehinmi was called to the bar in 1965 and he quickly set up a practice in mainland Lagos. His law practices soon grew and he became a mentor to many left-leaning lawyers and academics. Among his friends and ally included the legendary Fela Kuti and his human rights crusading brother the late Beko Ransome-Kuti. But controversially, Fawehinmi supported the candidature of a former Nigerian military ruler General Mohammed Buhari in the 2003 and 2007 presidential elections. Fawehinmi had fought Buhari for human rights abuses when the general was in power in the early 1980s. In 1993, Fawehinmi was awarded the biennial Bruno Kreisky Prize, an honour given to international figures who have advanced human rights causes. In 1998, he received the International Bar Association's Bernard Simmons Award in recognition of his human-rights and pro-democracy work. In 1994, he and some other notable Nigerians formed the National Conscience Party of Nigeria which exists till today and he stood for a presidential election in 2003 under the umbrella of the National Conscience Party. But Fawehinmi was more than an activist; he was also a philanthropist and a sharp legal mind. He gave scholarships to many poor Nigerian students and revolutionized law reportage in Nigeria with the establishment of the Nigerian weekly law report in the late 1980s, the publication becoming a valuable tool for law students and practitioners alike. Fawehinmi was elevated to the rank of Senior Advocate of Nigeria (SAN), the highest legal title in Nigeria in September, 2001. In 2008, Fawehinmi rejected one of the highest National honours that can be bestowed on a citizen by the Nigeria government—Order of the Federal Republic(OFR)—in protest of the many years of misrule since Nigeria's independence. He died on September 5, 2009. He is survived by two wives and many children.